Is вЂњP0706вЂќ detected? YES >> Go to TM-167, "Diagnosis Procedure". Adjust control cable. Refer to TM-150, "Adjustment". Select вЂњSelf Diagnostic ResultsвЂќ in вЂњTRANSMISSIONвЂќ. Perform вЂњDTC CONFIRMATION PROCEDUREвЂќ. Refer to TM-167, "DTC Logic". Is вЂњP0706вЂќ detected? YES >> GO TO 3. Disconnect transmission range switch connector. Check voltage between transmission range switch harness connector terminal and ground. Check continuity between transmission range switch harness connector terminals and TCM harness connector terminals. Check continuity between transmission range switch harness connector terminals and ground. Check transmission range switch. Refer to TM-169, "Component Inspection". Harness open circuit or short circuit between IPDM E/R and transmission range switch. 10A fuse (No. 45, IPDM E/R). Refer to PG-49, "IPDM E/R Terminal Arrangement". 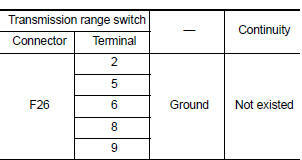 Check continuity between transmission range switch connector terminals. 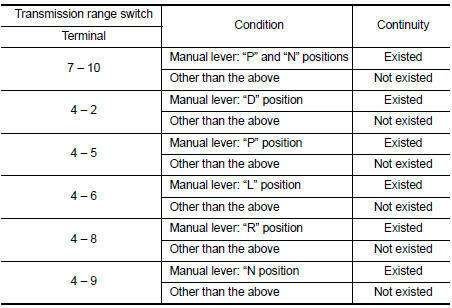 NO >> There is a malfunction of transmission range switch. Replace transaxle assembly. Refer to TM- 283, "Removal and Installation".